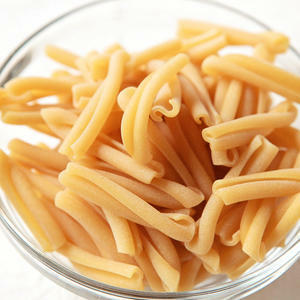 Pronounced “cah-sah-rech-ee”, a type of pasta shaped like a very narrow, twisted and rolled tube. The pasta originates from southern Italy, particularly the island of Sicily where casarecce has traditionally been used for popular Sicilian pesto recipes. Casarecce is a variation of the Arabian “pasta busiata,” that was made with a reed, giving the pasta its twisted, curvy shape. The smooth, porous texture makes this pasta ideal for supporting all types of sauces – from a light, garden pesto to a heartier, bold meat sauce. The s-shaped design means that the pasta is built to capture as much sauce as possible, making this ingredient a satisfying vessel for any of your favorite sauces. Casarecce is typically made from a few simple ingredients: semolina flour, water, salt and olive oil. The trick is acquiring the perfect shape and curvature so that the pasta can invite whichever sauce you choose to pair it with into every nook and cranny. Because this pasta can sustain heartier sauces, explore pairing this casarecce with more than sauce. Onions, mushrooms, cherries, and even pistachios all make delicious complements. Also try casarecce in your favorite casserole or baking it with roasted vegetables such as Japanese eggplant or sweet potato.